New Jersey-based Johnny B. 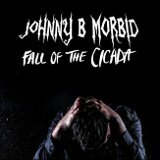 Morbid already was mixing some metal elements into their last album, but Fall of the Cicada, their most recent LP, really embraces them. Complex guitar riffs, tremolo picking, and blastbeats on a melodic punk album? That's not what I'd normally think of as hallmarks of modern punk, which may have abandoned lo-fi production methods but rarely loses its contempt for musical training and songwriting precision. But there they are, and they're paired with lovely melodies and a tight production that still rests on a firm bedrock of punk aggression. That a metalhead is in for an unexpected treat is clear on the first track, True Believer. The two-guitar riffs, many of which could easily end up on an In Flames album, just keep on coming -- I tried listening for repeats, and thus far I haven't been able to find a whole lot --, and the hoarse tenor of the band's eponymous vocalist complements them perfectly. I'm not a big fan of punk's vocal stylings normally, but Johnny puts so much power and emotion into what is really a fairly soft voice that once you hear it, it's impossible to imagine the band's sound without it. Before I Fade is an interesting mix of metal and punk; crunching riffs and solos vie for space with simpler palm-mute chorus-builders, while Crucifiction and Exile's blastbeats and tremolo-picking give an even heavier feel to those two songs. The melodies, though, are what really makes the songs stand out here. The dystopian Future in Flames has an Offspring-style chorus, with a thin, piping element of rage in the harmonized vocals, and one can hear a lot of Bad Religion influence in In the Unknown, but Johnny tends to write better hooks than either band, and the black metal-style two-guitar tremolo picking, used to devastating effect here, certainly makes the songs a lot more interesting. Johnny even tries a little harsh singing on the title track, though it doesn't measure up to his clean singing abilities, and really the title track is kind of ordinary melodically compared to some of the magnificent little pieces preceding it. Fall of the Cicada helps itself to many of the best attributes of some of the radio-friendly punk of the past and combines it with the precision and complexity of metal. Johnny B. Morbid demonstrates his clear understanding of both genres here, making this one an easy one to get into for anyone who enjoys the heavy and melodic.